Rotational molding, often known as rotomolding, is usually described as a plastic process suited for forming large hollow parts. This description was accurate 20 or 30 years ago but does not fully describe the process today. 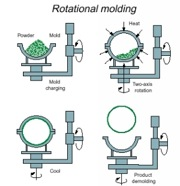 Rotationally molded products are a good fit for a wide range of industries. The most common are toy and juvenile products; industrial, agricultural, and chemical tanks; recreational and sporting goods; and material-handling parts such as totes, pallets, and bins. In their simplest form, rotomolding machines have three arms that rotate between loading/unloading stations, heating ovens, and cooling chambers. Molds made from either sheet metal or cast aluminum mount on each arm. A premeasured amount of powdered or liquid plastic goes in half the mold. The mold then closes and the arm moves it into the heating oven. Inside the oven, the molds simultaneously rotate around two right-angle axes. Heat fuses the resin into uniform layers on mold surfaces. The amount of resin added controls wall thickness. The rotating molds then move to the cooling chamber. As a combination of air and water cools the molds the plastic solidifies. Parts made from different grades of polyethylene (PE) dominate the rotomolding market. The most common grade of PE is linear low density (LLDPE). Others include high-density (HDPE), cross-linked (XPE), and ethylene-vinyl-acetate (EVA) copolymers. Polyvinylchloride (PVC) was the original material used for rotational molding and is probably the second most common material. It can be either liquid or powder and comes in a wide variety of durometers. Thermoplastics such as nylon, polycarbonate (PC), or polypropylene (PP) generally give better heat resistance, tensile strength, and stiffness than PE. Rotomolding is known for providing design flexibility, low-cost tooling, and stress-free parts. The above diagram shows a premeasured amount of powdered or liquid plastic is placed in mold half. The mold is closed, transferred to the heating oven, and then on to the cooling station. 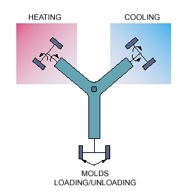 During the entire heating and cooling process, the molds simultaneously rotate around two right-angle axes. Above is a typical carousel rotationalmolding machine with three arms that rotate between loading/unloading stations, heating ovwens, and cooling chambers.